Survey says: Even our youngest respondents believe physical money will still be around in 2050, so don’t get rid of the piggy bank just yet. Financial experts Chris Longly (EMBA ‘13) and Latoya Goree had never met before this interview. But when asked about the future of money, their answers were largely the same: There’s no way to predict the future of finance, but there are plenty of ways you can prepare today. Read their advice to UMKC alumni. 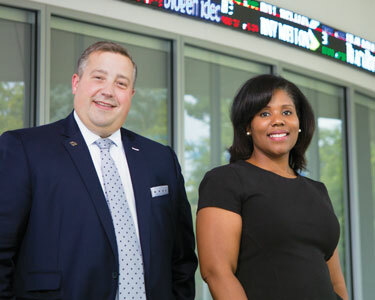 Longly, a financial advisor at Merrill Lynch Wealth Management and president of the Bloch Alumni Association, advocates a simple way to build wealth: Save more, spend less. Establish a budget. Aim to spend 50 percent on necessities (rent, utilities, etc. ), 30 percent on discretionary expenses (entertainment, clothing, etc.) and 20 percent on savings. Before you start saving for anything else, build an emergency fund. A good rule of thumb is 3-6 months of income or 6-9 months of living expenses. The key to success, Longly says, is all about creating healthy habits. For Goree, it’s all about discipline. In Longly and Goree’s conversation, several pieces of advice came up again and again. Here are some of their best tips and tricks. The first step of financial planning is assessing your income and your expenses. An easy way to do that (and Goree’s number-one financial planning tool) is through Mint.com, a website that allows you to build a budget, track your spending, save for future goals and more. A trick to coming up with your emergency fund: Write down your absolute necessity expenses for each month (rent, insurance, gas, etc.) Calculate the total, then divide it by two. That’s the number you should be saving for your emergency fund each month. In 12 months, you’ll have a solid emergency fund that will cover you. If you’re shopping for a new home, consider making a 20% down payment. This will help you avoid paying Private Mortgage Insurance (PMI) which is an insurance lenders take out on your home until you’ve generated sufficient equity in the home. PMI increases your monthly mortgage costs by $75-100. An accountant or tax professional can help you in any stage of life. They can help you calculate your exemptions and deductions more accurately, helping you maximize your potential refund. Maximizing a retirement account and Health Savings Account (HSA), if possible, are a great way to reduce the amount of taxes you pay each year while saving for the future. Solid financial planning is all about discipline. If you don’t start with discipline, and aren’t willing to make sacrifices, you’ll limit your success. When in doubt, contact a financial planner or tax professional.